When you think of a WordPress e-commerce plugin such as WooCommerce or Easy Digital Downloads, you probably imagine selling physical or digital products. Most people don’t realize that they’re also perfect for selling services online. In this ultimate guide to selling service products, I’m going to teach you how to sell services using a variety of plugins. We’ll look at how to keep it simple by creating a service order form without online payments. At the other end of the scale, we’ll learn how to sell services using e-commerce with either WooCommerce or Easy Digital Downloads. You’ll discover how to sell services for a fixed one-off price, by the hour or day, or sell recurring services with ongoing subscription payments. Along the way, I’ll provide useful tips on how you can upsell and sell more services to each customer. What does it mean to sell services online with WordPress? A service is defined as “The action of helping or doing work for someone”. This means that services are work that you provide manually for a person or organization. Selling services differs from selling products because you provide them directly to each customer. This may be face-to-face in person, or online. The key point is that you (or your employees/contractors) will be personally involved in providing services. A service cannot be fully automated, because if this happens then it becomes a product instead! With this in mind, you might be wondering how you can sell services using WordPress e-commerce plugins. After all, a service is carried out manually and not online! The answer is that you can sell services on a WordPress website by separating the sales and provision of the service. Services can be sold online in a similar way to products. The difference is that once a customer has ordered a service online, you will carry out work for them manually instead of posting them a product. So you sell the service online, and carry it out in real life. First, the customer visits your WordPress website and views a list of services. This might be a simple list of one or more services, or you might provide variation options. You might sell one-off services for a fixed price, or charge by the hour. Perhaps you’ll generate recurring revenue by selling subscriptions to your services? You might have a dedicated page for ordering service, or you might list the services in an e-commerce table directly on the pages describing your services. Non e-commerce option – The customer clicks on the service they require and completes an online form. The form will contain their contact information and anything else you want to collect. When they submit the form, you receive an email with their information. E-commerce option – The customer chooses any options and adds the product to the cart. They then view the cart and checkout, including paying online with credit/debit card or PayPal. The customer receives a ‘Thank you for your order’ email, and you receive an email with the order information. You can use this option with either WooCommerce or Easy Digital Downloads, including with the option for extensions such as selling time-based bookings – I’ll show you how to do all of these later. Finally, you contact the customer to arrange to provide the service. 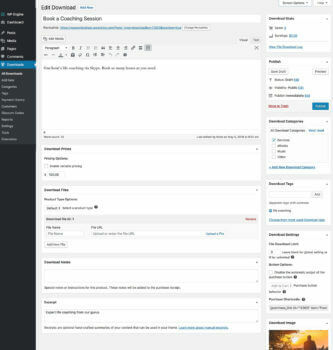 This is done outside of your WordPress website, so it will fit nicely into your usual working processes. Do I need an e-commerce plugin to sell services in WordPress? As you can see, you can use WordPress for selling services with or without an e-commerce plugin. So the question is, which option is best? If you want to keep it really simple, then you might want to sell services in WordPress but avoid the e-commerce side of things. This is easier to set up. However, you’d be missing out on many advantages of using e-commerce to sell services online. Online payment for services. By using a WordPress e-commerce plugin such as Easy Digital Downloads or WooCommerce, you can sell services and take payment online. There’s a choice of payment gateways such as PayPal and Stripe. This saves you time compared to collecting payment offline and chasing invoices. It’s also better for your service business’ cash flow because customers pay upfront, before you provide the service. Display services more effectively. When we get to the e-commerce section of this tutorial, I’ll show you how to list services in a searchable pricing table with filters, buy buttons and extra information. This is vital if you have more than a couple of services. Easier to upsell. WordPress e-commerce plugins come with options to sell more services through up-selling and cross-selling. This can involve advertising one service on the sales page for another service. Or it can involve adding optional extras to encourage each customer to buy more. Either way, it’s easier to do this if you’re selling services with WooCommerce or Easy Digital Downloads. Built-in recording and invoicing. With a simple service order form that doesn’t use e-commerce, your sales aren’t recorded anywhere. You have to maintain manual records about the services provided. In contrast, an e-commerce plugin keeps records of all your sales and sends invoices or payment receipts. This saves you admin time. To save even more time, there are even WooCommerce and Easy Digital Downloads extensions to automatically send data to accounting software such as Xero and QuickBooks. Reporting. E-commerce plugins come with built-in analytics and reporting. You can see statistics on who has bought your services and which are selling best, directly in the WordPress Dashboard. This helps you to make your service business more successful, making ongoing improvements over time. Offer appointments more efficiently. If you’re selling bookable appointments, you can save time and money by selling these services through WordPress. The easy of use should also drive more sales for you. Before we start with the setup instructions, I’ll share some examples of services that you can sell online. This is a tricky one because you can sell any type of service in WordPress, with or without e-commerce! You can use WordPress for selling services if you’re a law firm, doctor, online interior designer, or any other professional selling their services. You can do it if you sell your time, for example a web developer selling technical support by the hour. It’s possible to package services into specific ‘products’ which people can select and order from you, such as website technical support, online training sessions or coaching webinars. 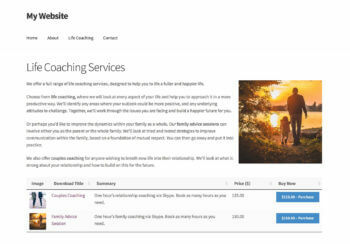 We had one web design client who used his WordPress website to sell remote Skype advice sessions. Whatever type of services you offer, keep reading to learn how to sell them online in WordPress. This is the easiest option discussed in this tutorial. It literally just takes a few minutes to set up. With this method, you can sell services online but you will take payment outside of your website. For example, they might pay in cash, check or bank transfer. Alternatively, you might accept payment over the phone. Whichever offline payment method you choose, it takes place outside of your website. This means you don’t need to install a WordPress e-commerce plugin. 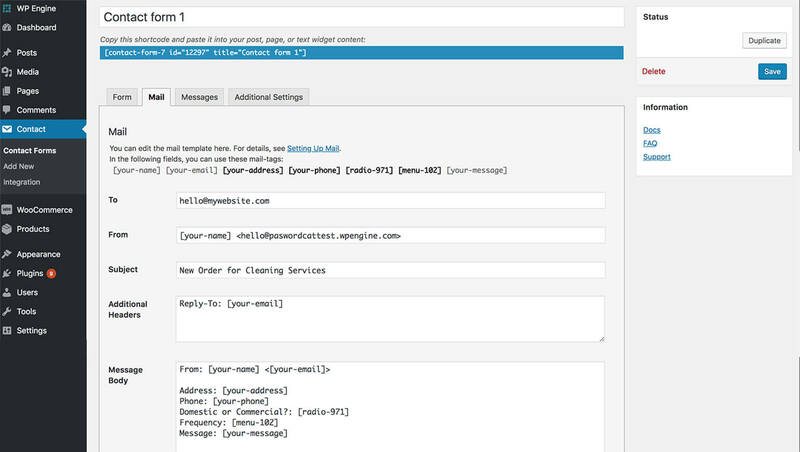 We’ll create an ‘Order a service’ form with the free Contact Form 7 plugin. This is probably the most popular free WordPress contact form, so it’s a good choice. If you prefer, you can sell services with offline payments using any other contact form plugin. Just bear in mind that the instructions below will be slightly different. Type ‘Contact Form 7’ into the search box. Install and activate the Contact Form 7 plugin from the search results page. 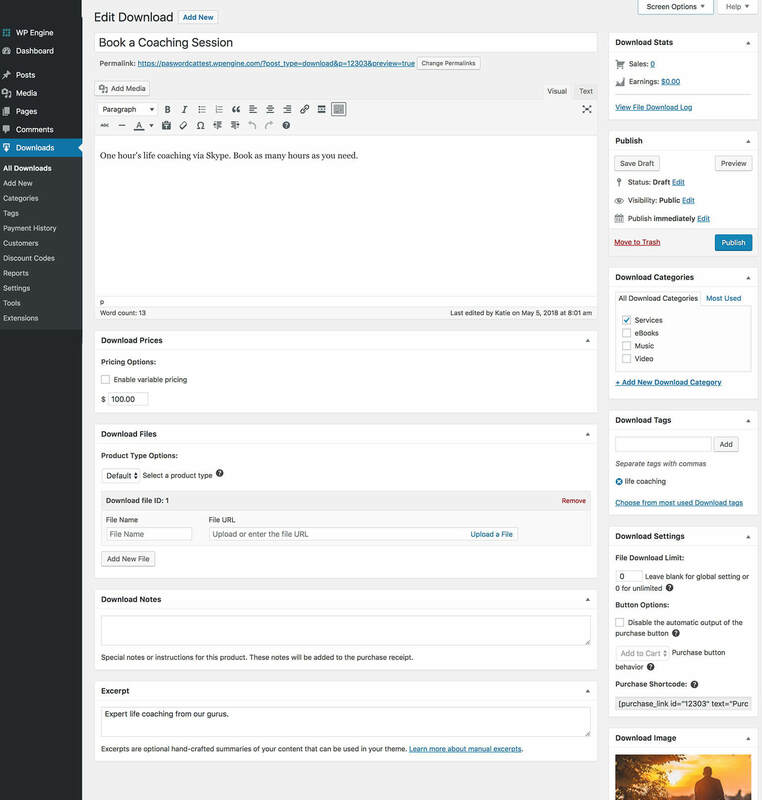 Next, click the ‘Contact’ link that appears on the left of the WordPress admin. Click on the default form to edit it. Use the Contact Form 7 documentation to edit the default form fields as needed. Go to the ‘Mail’ tab and enter the email address that you want the service orders to be sent to and from. Change the Subject to something self-explanatory. Make sure you add all the mail-tags that are listed under the ‘Mail’ tab title. This will add the form fields to the email that you receive when someone orders a service. Now, go to Pages -> Add New. You’re going to add your service order form to this page. Add a title to the page. This might be something like ‘Order Services Online’ or ‘Book Our Cleaning Services’, depending on what services you provide. Add any text to the main content area. Paste the shortcode that you copied in step 9 where you want the service order form to appear. View the page you just created. You’ll see a page on your WordPress website with a form which customers can use to order services online. Add the page to the website navigation menu, and link to it from any other pages where you describe your services. When someone submits the form, you will receive an email with the information they provided. You can then contact them, arrange payment and carry out the service. In Option 1, you learned how to sell services in WordPress without e-commerce or online payments. Next, we’ll learn how to create a more professional solution with e-commerce. WooCommerce is the world’s leading e-commerce plugin, powering over 44% of all online stores. While it does let you sell physical products, it also comes with virtual products that are perfect for selling services in WooCommerce. Easy Digital Downloads is popular for selling virtual and digital products in WordPress. It’s generally used to sell downloadable products such as WordPress plugins or ebooks. It’s also ideal for selling services in Easy Digital Downloads. Even better, both WooCommerce and Easy Digital Downloads are free WordPress plugins. I’ll recommend some paid add-ons that will help you to sell services more effectively. However, the core e-commerce plugins are free of charge. Like I said, WooCommerce and Easy Digital Downloads are both good options for selling services in WordPress. So which one should you use? A lot of service businesses sell using Easy Digital Downloads because it only deals with virtual products. This keeps it simple behind the scenes. However, the fact that WooCommerce can sell physical or virtual products isn’t a disadvantage. If you disable the shipping options then these will disappear anyway, which keeps things nice and simple in the WordPress admin. If there’s any chance that you might sell physical products and need to charge postage one day, then you should definitely choose WooCommerce. This simply isn’t possible with Easy Digital Downloads. It’s also slightly easier to use WooCommerce to list service products in a table. I’ll show you how to do this with both plugins in the next sections. However, there’s one extra step with Easy Digital Downloads that happens automatically with WooCommerce. If you want to sell your time based on the number of hours or days, instead of charging a set price for each service, then WooCommerce is best. If any of these points apply to you, then I’d recommend selling services in WooCommerce rather than EDD. Otherwise, they’re both excellent options and you should read about each one to choose which is best for selling your services. 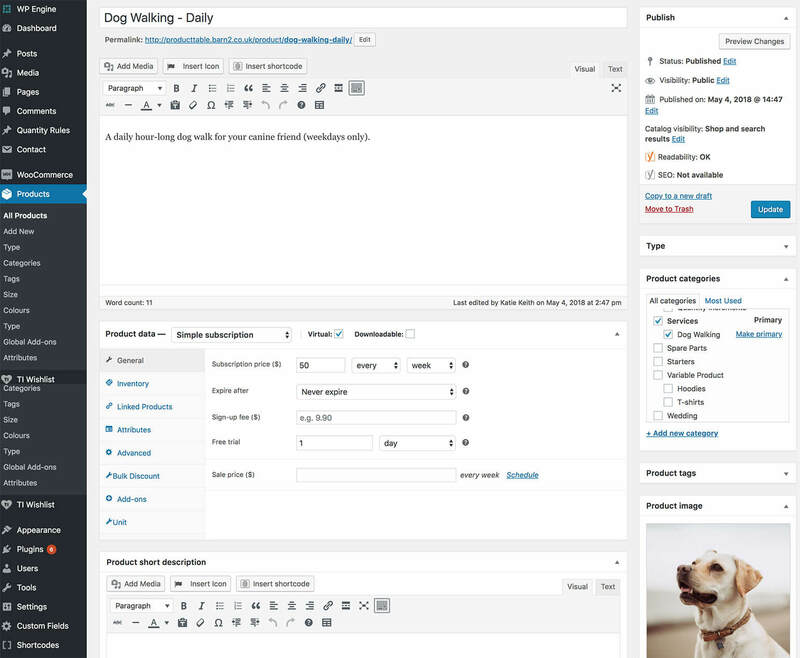 In the WordPress admin, go to Plugins -> Add New and search for ‘WooCommerce’. 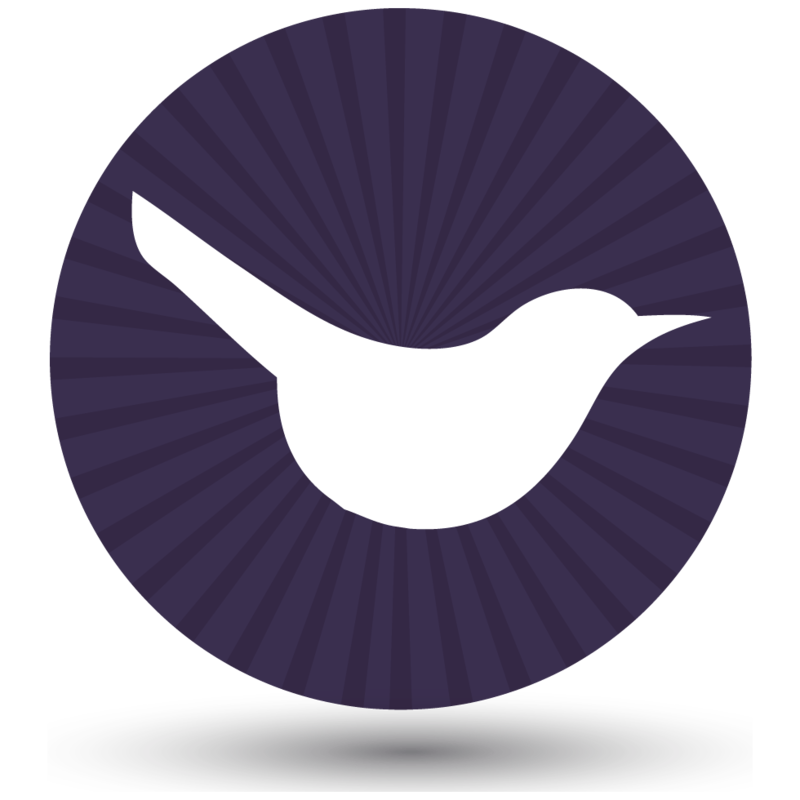 Install the main WooCommerce plugin and activate it. After you activate WooCommerce, you’ll be invited to run the Setup Wizard. Do this, and choose your store currency, tax settings, etc. When it asks “Will you be shipping products?”, do not tick this box. You’re selling services, so you won’t need the shipping settings. At the end of the Setup Wizard, click the button to Create Your First Product. You’ll be taken to the Add Product screen. This is where you’ll add the first service to sell in WooCommerce. 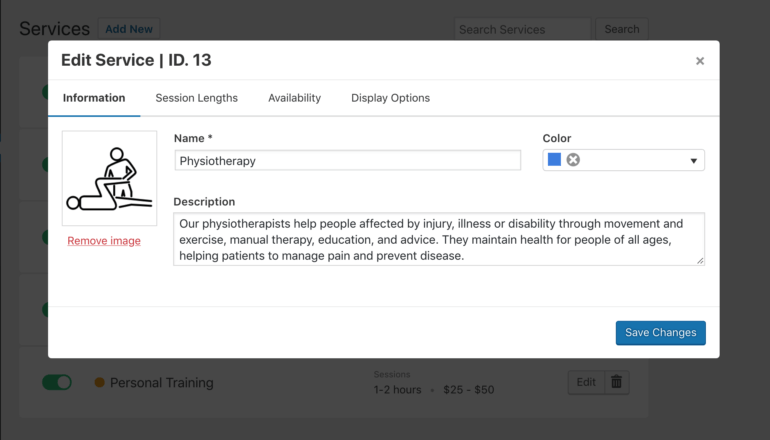 Add a product title and description, plus categories and tags as required. Also upload a product image if you like, although this isn’t essential for selling services with WooCommerce. Use the ‘Inventory’ tab to limit the number of each service that people can buy from you in WooCommerce. This is useful if you have limited capacity. There’s also a box that you can tick to prevent customers from buying more than one of each service. Go to Products -> Add New and repeat these steps for each service that you want to sell in WooCommerce. Next, we need to display your service products on the front end of your website. This is essential so that people can view your services in WooCommerce and buy them online. WooCommerce comes with some built-in layouts for displaying products. Unfortunately, these aren’t at all suitable for selling services. You don’t want your service website to look like a clothes shop! Instead, you need to list your services in a professional-looking table layout. You can do this using the WooCommerce Product Table plugin. Once you’ve added your services as WooCommerce products, the Product Table plugin will automatically list them in a user-friendly table layout. Start selling your services online today! 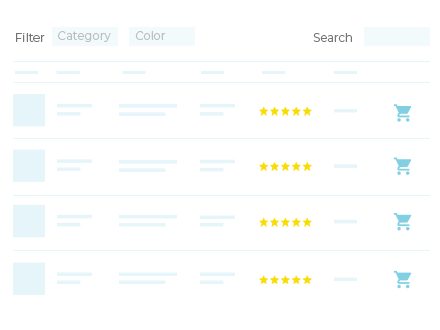 Services sell better in a WooCommerce table because this layout prioritizes information rather than images. (You can include a small thumbnail picture if you like.) If you have lots of services, it’s easier for customers to find the services they need via built-in filters and keyword search box. Customers can view prices, choose options and add services to the cart directly from this service pricing table layout. The other benefit of listing services in a table is that you can insert the table anywhere on your website. For example, a lot of WordPress sites have a ‘Services’ pages containing text describing their services. It’s best to list the services for purchase directly on the Services page, instead of linking customers to a separate shop page. You can add an e-commerce table of service products directly within the content of your service pages, keeping everything in one place. Install the WooCommerce Product Table plugin on your WordPress website and activate it. Header over to WooCommerce -> Settings -> Products -> Product tables. Paste your license key from the confirmation email. Read through all the product table options, and choose the ones that will present your services most effectively. Next, create a page where you want to list your services. Alternatively, edit an existing page on your website. For example, you might want to list the service options with prices and buy buttons directly on a page which already describes your services. Click the ‘Insert product table’ toolbar button to add the following shortcode to the page [product_table]. This will list all your services on the page. If you’d rather list specific services only (e.g. based on their category or tag), then you can do this instead. In step 2, I told you how to create a simple service product with a fixed price and no options. WooCommerce also supports variable service products. The instructions to create a service with variation options are similar to the ones in section 2, above. However, when you go to the Product Data section, use the Product Type dropdown to select ‘Variable Product’. You then need to create attributes on the Attributes tab, and select these to create variations on the Variations tab. For each variation, you need to add a price and tick the ‘Virtual’ box to use it to sell services. In this example, I created a ‘Legal Services’ product with a ‘Service Type’ attribute. I used this to create variations for ‘Conveyancing’, ‘Wills’ and ‘Divorce Services’, each with their own service cost. So far, we’ve talked about how to sell services in WooCommerce with a one-off price for each service. This may fit your business model, but most business owners know that recurring revenue is the holy grail. With this in mind, you might want to sell ongoing subscription services via your WordPress website. Fortunately, you can do this with the official WooCommerce Subscriptions extension. This will set up an ongoing payment plan or subscription for each service. The customer will be billed automatically at the correct intervals, using their chosen payment gateway. First create a subscription on the plugin settings page. Next, instead of creating a Simple Product, you should select ‘Subscription Product’ from the ‘Product Type’ dropdown. Set an ongoing cost for your service, for example an initial setup fee followed by a regular monthly payment. Both PayPal and Stripe support recurring subscription payments. This is much better than sending invoices for manual payment each month. No more chasing overdue invoices – it all happens automatically via your WordPress website and WooCommerce! See it in action on our pet sitting services demo page with subscription products! Please note that WooCommerce Product Table doesn’t work with variable subscriptions. To use the plugins together, we recommend adding each subscription option as a separate product. Another option is to add the options as product add-ons instead of variations. 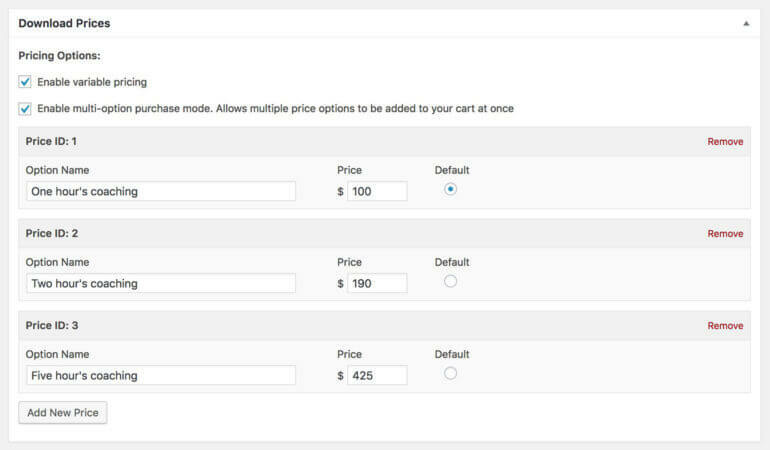 The add-on options will appear in the add to cart column of the table of subscription services. Let’s say you’re selling website maintenance services. You might have created 3 service products: Weekly Maintenance, Fortnightly Maintenance, and Monthly Maintenance. But how can you sell more services to each customer? The answer is the official WooCommerce Product Add-Ons extension. This handy plugin lets you add a range of optional extras to your service products in WooCommerce. These appear alongside the add to cart button, offering a powerful incentive for customers to order more from you. In the following example, I used Product Add-Ons to add tick boxes for extra dog grooming service options. As well as ordering a basic dog grooming session, customers can tick boxes to add different types of doggy haircut. 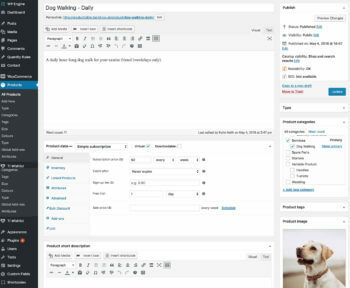 The dog grooming products are displayed using the WooCommerce Product Table plugin with Product Add-Ons and Subscriptions. As you can see, this is a great way to significantly increase revenue, from the same number of customers. You’ve learned how to use WooCommerce to sell services for a fixed price. But what if you want to sell your time, rather than a specific service? Luckily, you can do that too. Tick the ‘Quantity’ box to display a quantity picker in the add to cart column for each service. When you set your product table columns, use these instructions to customize the ‘Buy’ column heading. It needs to be clear that the service is priced by the hour or day. By now, you know how to list your services in a WooCommerce table layout. Maybe you want to show extra information about each service, but don’t want to send people to a separate page for each service. Maybe you have too many variations or add-on options to fit into the table view. Tip: Use bulk discounts to sell more services! Lots of services providers offer discounts to reward customers for buying more services. You can do this by installing the WooCommerce Dynamic Pricing plugin. Set it up to give discounts for customers who buy more. Mention the discount in a prominent place on your website, or within any column in the table of services. Next, I’ll reveal how to use Easy Digital Downloads (EDD) for selling services on your WordPress website. In the WordPress dashboard, head to Plugins -> Add New. Type ‘Easy Digital Downloads’ into the search box. Navigate to Downloads -> Settings and choose the settings that you’ll use to sell services with Easy Digital Downloads. Go to Downloads -> Add New. Add your EDD service product name and description. You can also add categories and tags, plus an image if this will help to promote the service. Repeat these steps for each service that you want to sell using Easy Digital Downloads. Easy Digital Downloads also comes with a ‘Variable Pricing’ option. You’ll see this when you add the price for your service in EDD. If you want to offer different options for a particular service, tick this box and add all the options, each with their own price. You can use this to provide quantity discounts to reward customers to buying more services, or for selling different service options at different prices. Next, we need to display your services for sale on the front end of your website. Like other WordPress e-commerce plugins, the standard Easy Digital Downloads store layouts aren’t ideal for selling services. This isn’t surprising, because they’re mainly designed to sell digital products such as ebooks and WordPress plugins. You can list services more effectively with the Posts Table Pro plugin. This dynamic WordPress table plugin lets you list all sorts of content from your website in a table view. It’s particularly popular for creating an Easy Digital Downloads product table. Customers can view a list of services anywhere on your website, see the price and any other data you choose to display, select options, and add services to the cart. They can then checkout and pay for their services online with Easy Digital Downloads. Install the Posts Table Pro plugin on your WordPress website and activate it. Go to Settings -> Posts Table Pro and activate your license key from the order confirmation email. Follow the instructions in this tutorial to list your EDD service products in a table. You can use Easy Digital Downloads to sell services via any page on your website. 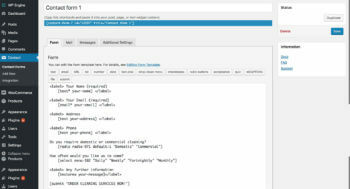 Just put the Posts Table Pro shortcode wherever you want to list the services. The easy way to list services with Easy Digital Downloads. Finally, you can install the EDD Recurring Payments extension to take regular payments for services. This automates the payment for regular services, so you don’t need to worry about taking payment manually. You can also use the EDD Bookings extension to sell services using Easy Digital Downloads. This means that a client can pay for a service for a specific period of time. This can apply to doctor’s appointments, yoga sessions, consultancies, hairdresser appointments and much more. Once the extension is installed you can set up Services, each with their own set of criteria. Every service will have its own name, description and image, all of which are used when the client is selecting a service from the booking form. 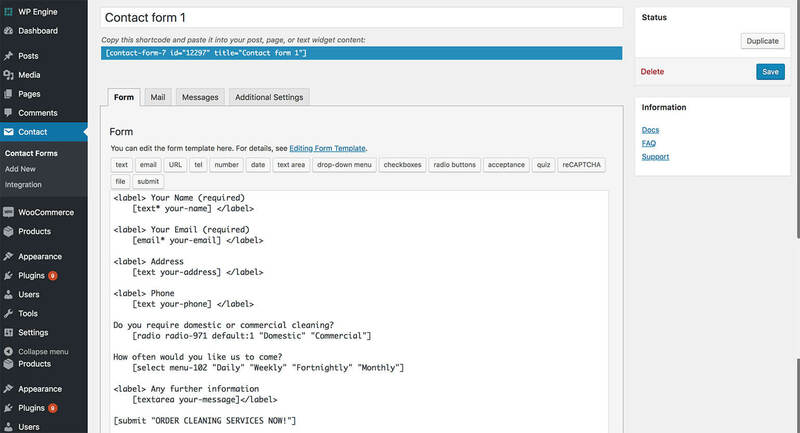 A service will also have one or more session types. For example, a consultancy could be offered as a 30-minute session or a 60-minute session. They would each have their own price. The availability of a service is when it will be available for booking. 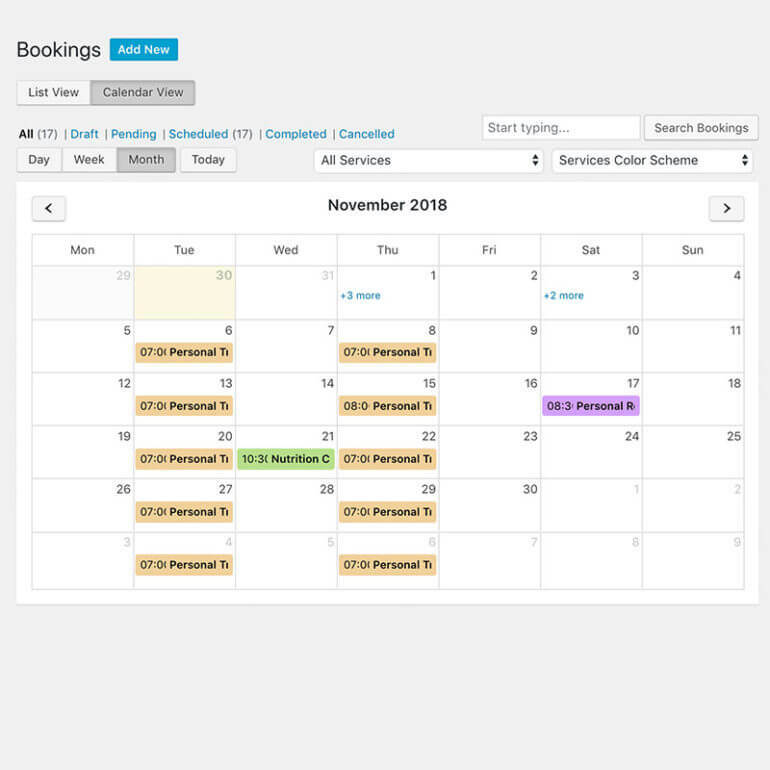 As an admin, you can set up various rules to determine the dates and times your clients will see as bookable on the calendar in the booking form. To list your bookable EDD products on your website, follow the instructions in the previous section to list them with Posts Table Pro. Instead of having purchase buttons directly in the table, use the ‘Links’ option to allow customers to click through to the single download page for each service. From there, they can complete the booking form and purchase the service. As the business owner, you will be able to monitor all your bookings from a list or calendar view. 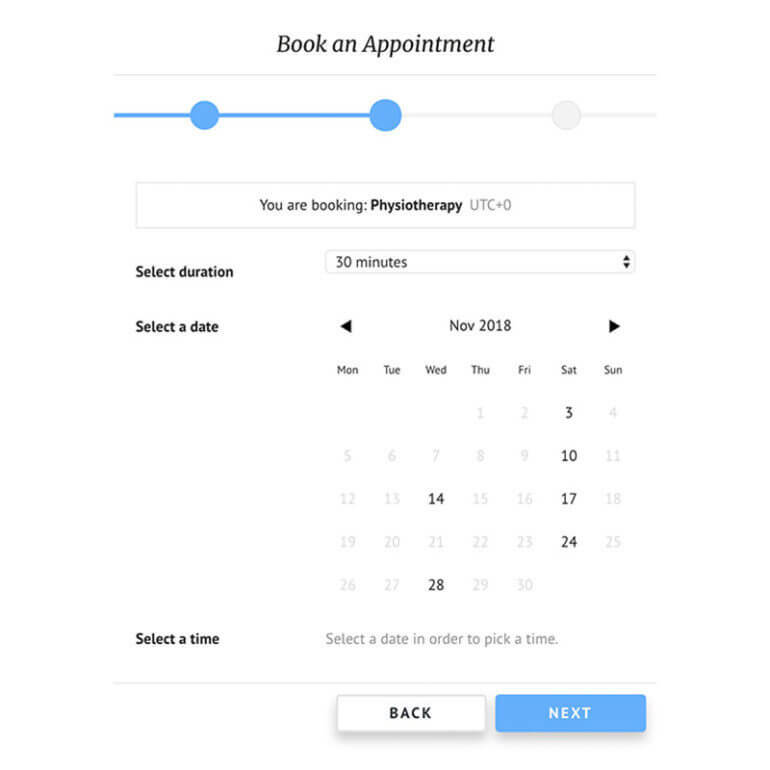 You may also create bookings manually from the back-end, which works great for bookings that are requested in-person, on the phone or via email. If you want customers to book specific times, then combining Posts Table Pro with EDD Bookings is the perfect solution. A big benefit of selling services online in WordPress is that you can collect extra information about customers. Getting them to enter the information on your website is easier than taking it over the phone or manual paperwork. It’s also more secure, because you have electronic proof that they provided the information. This is particularly important if you need customers to tick to agree to your service Terms and Conditions. When you’re collecting information about customers, just make sure your website is GDPR compliant. WooCommerce and Easy Digital Downloads come with features to help you ensure GDPR compliance. If you’re selling services with a contact form plugin such as Contact Form 7, then you might need to add extra tick boxes to gain consent. Start selling services in WordPress! Even though you carry out services manually, you can save time and get more customers by selling services in WordPress. Use the instructions above to let customers order services online and pay manually, or automate the sales process for your services using WooCommerce or Easy Digital Downloads. Once you’ve added your services to WordPress as e-commerce products, use either WooCommerce Product Table or Posts Table Pro to display them in a user-friendly layout. This is the best way to attract customers and sell more services. If you’ve used any of the methods in this tutorial to sell your own services, please let me know how you get on. I’d love to add some case studies to this article (which will include a link to your website!). Please add your comments below. Hi Katie, and thanks so much for this information! I plan to follow your instructions and will let you know how it goes! I was just googling and got useful content which is tempting me to implement above mentioned instruction on my site. Thank you for step by step guide. I already used EDD for software products but didn't realise you could use it for services too. I've also just found there's an extension for EDD which is called 'Downloads As Services'. You can find it in the add-ons section on their official website. It changes the payment confirmation page a little bit so it's more suited for when selling a service. Thanks Chris, that looks brilliant and will work nicely with the other plugins discussed in this article. Great! But I hope you will publish post about SEO about services on woocommerce becouse I am confused about duplicate and thin conntent for simillar services. Hi, I recommend that you check out Yoast's excellent SEO tutorial which covers everything you need to know including duplicate content. I have one question, is there anyway we can gather some additional information after payment has been processed if we use WooCommerce? Hi Ryan, WooCommerce is all about taking information pre-order. You can gather additional information pre-order using the Product Add-Ons extension (if you want to collect information about specific products), or the Checkout Field Editor extension (if you want to collect information about the order as a whole). The information will then be passed through to you in the order notification email to the administrator. Use any WordPress forms plugin (e.g. Contact Form 7) to create a form to collect the information. If you want to make this price so that only people who have paid can access it, then password protect the page that the form is on.